I am a newbie/proud owner of a Mazda Bongo 2.5 turbo diesel, automatic '96 that has come to needing to pass its MOT and unfortunately has failed. I am also relatively new to owning vehicles as I've been driving for two years now and am also a newbie to forum sites, having stayed away for fear of online disputes, can I say it's been wonderful reading through comments on BongoFury, a community being built through shared interests and people genuinely wanting to help and share knowledge, I hope to gain enough knowledge and experience to be able to offer other Bongo newbies the same guidance, one day! For now I would please ask for some advice.. I realise it may seem like a lot, but I am determined to stay positive and not give up, so..
the fuel filter - when you buy the cylinder, I believe it doesn't come with a cap? How do I purchase the cap? Any advice on the dented tank, prepared to remove, clean and is tapping out possible!? What is the gaitor I'm looking for, I can't source it by the word gaitor..? MOT how and where am I legally allowed to drive to fix my vehicle, so ambiguous online.. I'm unsure of how to proceed, do I source and purchase the parts and then speak to a garage or do I approach the right garage and they order the parts? Any advice welcome and thank you in advance, especially if you made it to the end of this lengthily post! Which is your nearest town, the SE is quite a large area and not that many well recognised Bongo aware garages, although the main thing with Diesel's is the cooling system and bleeding the air out if the garage needs to play with the cooling system at all. 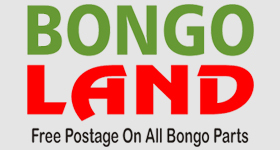 also there are several Bongo shops fr spares starting with Bongoland above top right! Hi, thank you for a speedy and helpful response i will check out the links you've added right away..
Am I correct in thinking fuel filters don't come with the cap? What would your advice on the chicken and the egg question - order parts and seek garage or seek garage to order parts!? I tend to give my garage the contact numbers for parts, then they obtain and fit and can't then say it was the part that was faulty as they obtained it and fitted it. Whilst there have been reports in the past of garages saying yes will fit your parts but no warranty! Having said that my garage has never given me any problems anyway and have actually called me for suggested parts places for Bongo's as they know I am aware of the locations and likely availability!